Growing up with Hawaiian/Japanese neighbors you learn a bit about rice. For one, buy a rice cooker.. it’ll become your favorite kitchen aid!! Also, if you’re planning on consuming it the next day, it’s not necessary to refrigerate leftover rice until morning, simply leave it covered on the counter top. But what to do with it in the morning? 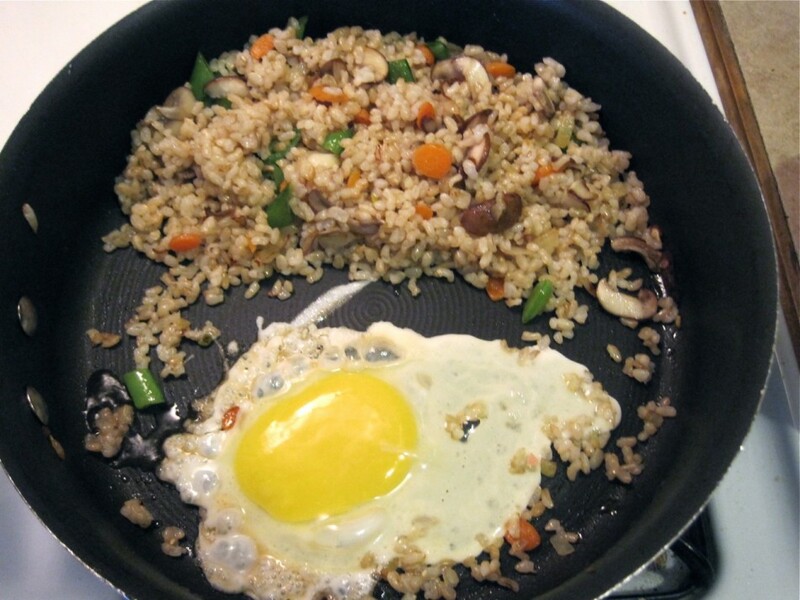 A little egg + some veggies = fried rice. Eat it for breakfast or pack it for lunch. Any veggies you have in the fridge will do, but onion is an important ingredient for flavor. For this dish I used onion, carrots, sugar snap peas and mushrooms. Saute the onion and crisper veggies in coconut oil until soft, add mushrooms and toss for another minute. Drizzle in a teaspoon of toasted sesame oil, for flavor, then pile in last night’s rice and stir. Sprinkle in a couple tablespoons of water, if necessary, to loosen up the rice and help it steam. Once the rice is nicely reheated, push to one side of the pan and crack an egg in the other. Fry the egg until the edges whiten and then scramble with spatula. Toss the rice together with the egg and serve while hot. 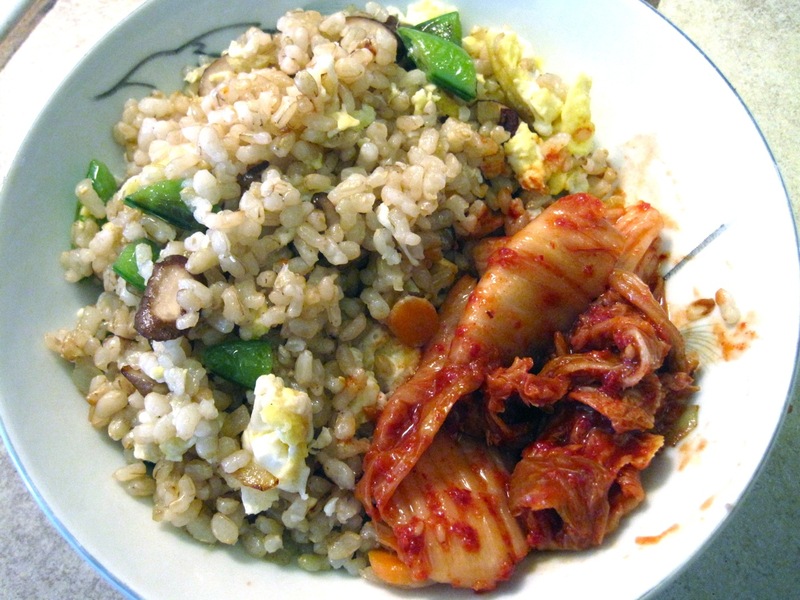 I added napa cabbage kimchi on the side to spice it up. Mmmm mmm mmm. 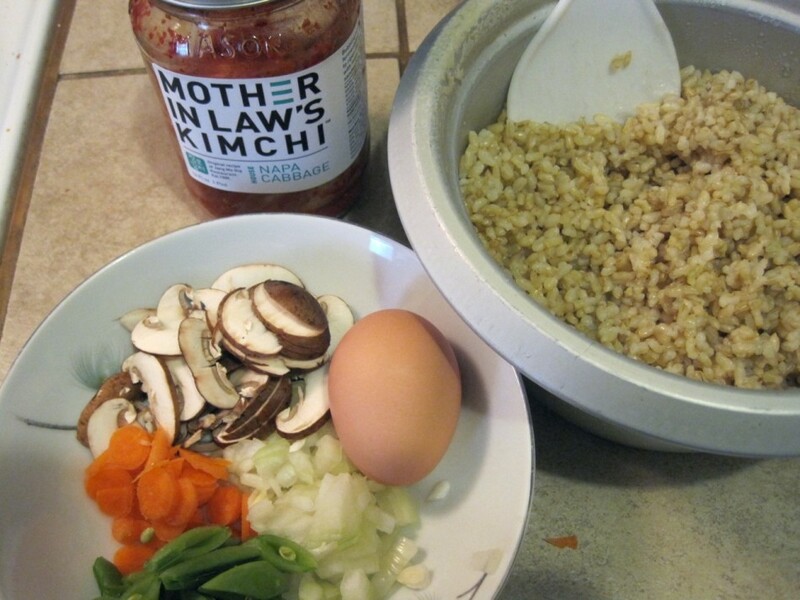 February 19, 2011 | Filed under breakfast, brunch, gluten free, lunch, vegetarian and tagged with asian, breakfast, brunch, egg, fried rice, gluten free, lunch, rice, veggies.